An architectural clump-forming perennial with elegant large, light green leaves,excellent for a bog garden or pool side. In mid-summer, plumes of fragrant, white flowers rise from umbrella like foliage. Sun or shade and adequate moisture. Categories: A-D, Autumn, Featured Plants, Plants A-Z, Plants by Season, Plants In Situ, Spring, Summer, The Bog Garden and Bank, The Cottage Garden, The Secret Garden. 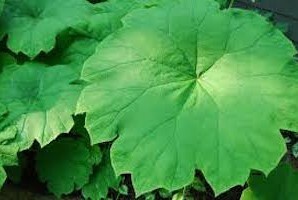 Large, round, simple leaves, the size and shape of a dinner-plate (or a tea-tray, in very moist soil), dimpled in the centre where they are attached to the stem. The leaf edges are slightly scalloped. One of the most beautiful and calming of leaves for a shady place. A strong flower stem carries heavy drooping clusters of star-shaped creamy-white flowers in late summer.